In the UK there wasn’t a baby boom that started about 1945 and ended about 1965. Yet the belief that there was is embedded so deep in the nation’s psyche that people casually assume it in conversation without needing to justify it. The people they are talking to probably also believe it. (If you also believe it, have a look at “Further reading” at the end of this article. The evidence to the contrary from credible sources such as the Office of National Statistics is overwhelming. And I am not the only person to have pointed out this error). This must surely be a major influence! In the following diagram I’ve superimposed (accurately enough to make the point) the birth rates (per 1000 of the population) of the USA and the UK from 1910 to about 2010. The USA values are in blue & red, and the UK values are in green. The most important region is the yellow rectangle. The United States Census Bureau defines the USA demographic birth boom as between 1946 and 1964 (the region in red). It appears reasonable to do so. Much of the literature about baby booms has been influenced by the USA, and Wikipedia (where the USA graph came from) concentrates on the USA. Most articles about baby booms found by Google are about the USA, although they often don’t bother to say so. The birth rates in this diagram are to the same scale for the USA and the UK – imagine the impact of this baby boom in the USA! But the birth rate for the UK was very different! After the immediate-post-war spike, (which never rose as high as in the USA), the rate dropped dramatically by the early 1950s. 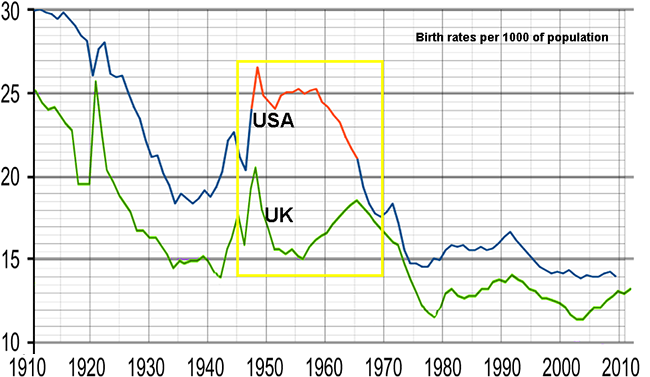 Then (while the USA birth rate was dramatically dropping from the late 1950s) the UK rate rose from about 1956 to a peak at about 1965 (which is near the end of the USA birth rate boom), before slowly dropping away. The above section shows birth rate values. The surviving population (where obviously the death rate also matters) is rather different. Older populations had a higher early-age death rate, and even those who survived to adulthood have had extra time to die. So birth rate is not a match to the population that can be discussed and influence political and economic trends. Those births were noticed at the time, and those who survived to childhood were noticed in school. But that is now totally irrelevant! Only the surviving population at any date of interest matters. In the following diagram the line in green is the same as the above diagram, while the line in blue is the actual population (in 2010) rather than the birth rate. They have a different vertical scale so their relative vertical position is irrelevant. What matters is the shape from left to right, (that is, by birth year), showing the contribution of the birth rate to the population. This diagram makes it even more obvious that it is nonsense to think of a large baby boom cohort from about 1945 to about 1965, because lots of people born in the decade after the war are not alive today. For example, only about 81% of the people born in 1946 are alive today. As with all graphs from the Office of National Statistics, it is seen that the main baby boom cohort is from about 1955 to about 1974 with a peak at about 1964-5, while the 1945 to 1965 cohort is not very distinctive except for a short spike from 1946 to about 1948. See also “The myth of the UK baby-boom“, which shows the equivalent of the blue line. In 1946 and 1947, nursing homes (this was before the NHS) had to cater for a sudden and unprecedented increase in the number of babies. It was perfectly reasonable for those dealing directly with births to see it as a boom! Then as those children went to school, they put a strain on classrooms and teachers which had never handled that many children in a year. Nursing and early education are both cases where the exact year of birth is directly relevant. And for these 2 years (and to a lesser extent 1948-9 too) there is no doubt about the significant spike in the births in each of those years. When those children became adults, their exact year of birth became increasingly irrelevant. They are just part of the electorate. (Maximum about 3% but declining). They are just part of the working population or just more pensioners. (Entry to work was spread over 6 years; about 75% left school at 15, about 20% left full-time education from 16 to 18, and 5% went to university and mostly entered work at 21. Reaching State Pension Age was also spread because it was 60 for these women and 65 for these men). That spike of a few years has become “noise” in the population as a whole – but the memory lasts! Everyone already alive when they were born remembers the sudden increase and its impact at the time. But that says nothing about any broader influence. (This is apart from the fact that only about 81% of people born in that “spike” are alive today). Some articles want to talk about “the elderly” or “the generation older than me” in general terms, perhaps to describe their lifestyle or wealth or poverty or attitudes, etc. Unless the article is tightly focused, it is likely not to care about a precise definition of the people being talked about.”Baby boomer” is a term which “everyone” understands, and lots of other articles use, so it is natural to use it. Even though few if any of these articles get it right! I suspect that for many people the meaning of the term has been lost, and it just means “the immediate post-war generation”, without thought about birth rate, which may even be irrelevant to the article. There may be a “memory error” when being casual. Each cohort becomes a smaller percentage of the electorate over time. The population is increasing, and older people are dying, so each cohort becomes “a smaller fish in a bigger pool”. Memories from years ago of the size of the 1945-1965 cohort may ignore the fact that (for example) a particular year such as 1946 will have shrunk from about 1.7% of the population at the time of Thatcher’s election to about 1.3% at the time of Cameron’s election, a drop of nearly one-quarter in 31 years. The ideas that there actually wasn’t such an influential cohort, and that many older people don’t live in posh houses, or don’t have expensive holidays, or don’t even get a full pension, can be invisible and so not be considered when assigning blame. Even worse: the possibility that there is no blame, but the state of the nation is largely formed by chance or external global influences, is not a desirable outcome. The mental comfort of a concept is more important than its truth. Other sources of blame are rich baby boomers (or near baby boomers) on guilt trips. Some of the errors about the demographics come from them. After all, the main baby boom population, born from about 1955 to about 1974, are aged from 38 to 57, and people in that range may not yet feel guilty. It is more likely people older than them, and perhaps not real baby boomers at all, who have had the time so far to become wealthy and have a chance of feeling guilty. (For interest, in the 2005 election the post-1965 electorate was larger than the 1945-1965 electorate. From that date onwards the difference becomes greater year by year). When assigning blame, there is a tendency to claim “baby boomers are to blame” when what is meant is “baby boom politicians are to blame”. For example “What Did The Baby Boomers Ever Do For Us?” by Francis Beckett is really a book about baby boomer politicians, especially Tony Blair and Gordon Brown, and not about a whole baby boom cohort. But readers are left with the impression that those politicians are representative of a whole generation, which obviously they are not.